Here’s an interview we did for Inpress Magazine a few months back for those who didn’t get to read it before. What do you think is your band’s greatest strength? What was your worst gig ever and why? If you could time travel back to any gig in history which would it be and why? What movie do you think your music would best accompany and why? What are your plans for the immediate future? And the rest of the year? Favourite “pick me up for a bug night” drink? In case you missed it, the new band featuring Adam, Marki and myself; Shotgun Zero; had their first gig last week at Musicland. Check out the full story over at the Shotgun Zero website. Adam, Marki and Doc form new band: Shotgun Zero! 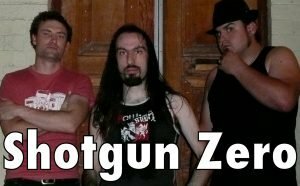 With Nitidus now officially on indefinite hiatus, Marki, Adam and myself (Doc) have reformed under the name Shotgun Zero. After performing several shows as a three piece (including an incredible show with the Hoodoo Gurus) and writing some exciting new songs, it became clear that the Nitidus name was no longer relevant to the band we have become. It has been a long and gruelling struggle to find a new name, but we finally picked Shotgun Zero and are now moving ahead to create more new sounds. Be sure to subscribe to the Shotgun Zero blog to get all the latest news on upcoming Shotgun Zero events. Spread the word, Shotgun Zero is here and ready to rock your world! So long! Nitidus on indefinite hiatus. Early in 2008, lead singer Patrick “PC” Clemenger made the hard decision to move back to New Zealand to start a family, while Nitidus continued to perform around Melbourne as a three-piece with Marki, Adam and myself (Doc). The four of us reunited once more in February 2009 for the A.R.E.A. 9 festival in New Zealand, where we had an absolute blast. We had great creative chemistry, despite not having played together in almost a year. When the three of us inevitably returned to Australia, we no longer wanted to continue as Nitidus without founding member PC on the mic. 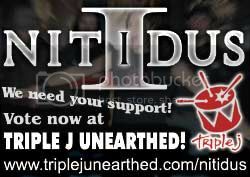 As a three piece, we feel that the band has changed significantly, and so it was agreed to hang up the Nitidus name. We’d like to thank everyone who has supported us over the years, we couldn’t have come this far without you. 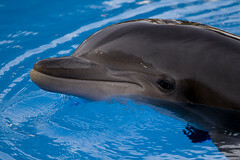 We hope you will continue to support us in our next endeavours, but more on that soon. PC, Marki, Adam and Doc remain on good terms and continue to be active musicians. You haven’t seen the last of us, so make sure you’re subscribed to this blog for news in the near future. Firstly, congratulations to HR King for winning the Perisher Launch Your Band Australian music competition for his song Fearless. Of course that also means that Nitidus didn’t win unfortunately… but for every door that closes, another opens and once more we put the call out to you awesome people to flex your voting power. Create a free OurStage account. 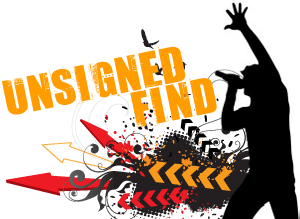 From April 1, start judging in the Triple M Unsigned Find channel. You’ll automatically be entered to win $5,000! Each vote = 1 entry into the draw. Have fun, good luck and thanks for your support, you guys rock!